Readers, apologies for being quiet over the summer months, it seems to be how things go in the blogging world. I’ve been doing lots of dining out posts recently, probably because we are so spoilt by amazing restaurants in Glasgow. Since moving Southside last year, Shawlands has seen so many new places open. 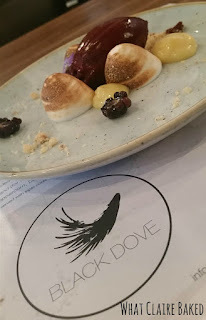 We’ve been saying for months that we’ll try out Black Dove and never quite got round to it, then in the space of 3 days, we visited Black Dove and Pazzo (next door) for lunch and dinner. My lovely Ma and Pa are not quite city dwellers, so every time they come here I try to take them somewhere nice and showcase the great food offering we have locally. Black Dove on Kilmarnock Road opened around a year ago and its black signage and sleek looking brand really elevated the venues locally to a new level. Until last week and a chance visit to the 5pm website, I had no idea they did any sort of dining deals. By chance, I found a lunch special, offering 2 courses and a soft drink or beer or wine, for £12 per person. My parents aren’t big fans of overly “fancy” food – so I was delighted to see fish and chips (albeit a classy fish and chips on the menu). There were a number of meat options, but they decided to play it safe. Unusual for me, I went for a vegetarian option. 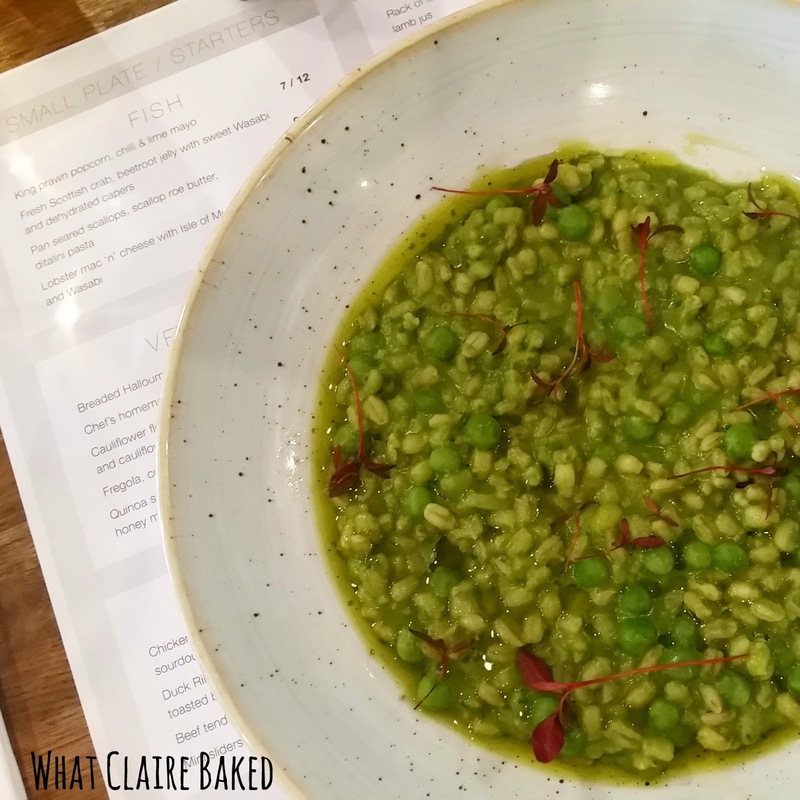 I had the pea and pearl barley risotto. Delicious but as the pearl barley was so filling, also unusual for me, I never managed to finish it off. Dessert options were beautifully presented. I’ve been trying to cut out and avoid dairy, so have eaten A LOT of sorbet this summer. 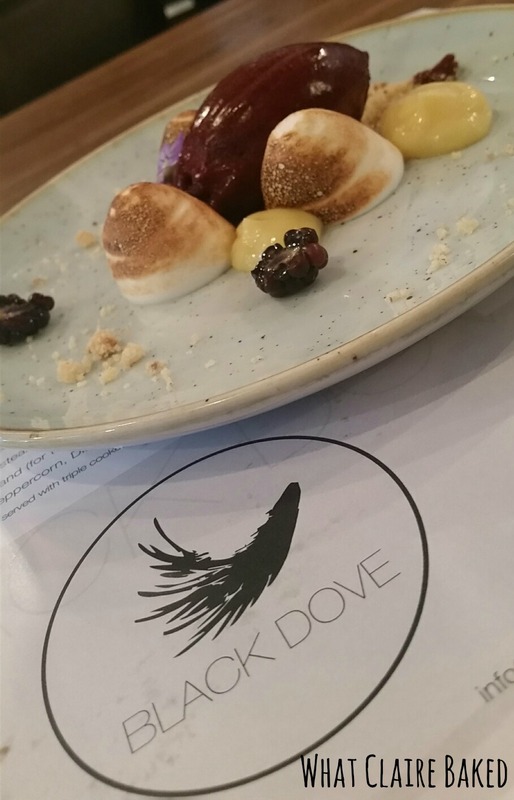 Luckily, the blackcurrant sorbet at Black Dove was paired with meringue, lemon curd and edible flowers, elevating it to a delicious and refreshing dessert. Dad went for the chocolate ganache, caramel and banana combo which usually would have been right up my street, but alas, not this time. There were a few other tables in on the Monday we went – from friends, to a young family and me, the grown up with my folks. Service was great, food was timely, but not rushed – we were in and out in an hour and a half. Now I have an idea of the amazing standard of food, I look forward to heading back with Mr WhatClaireBaked in the near future.